My good friend Texas Chef Bill Moran and I recently came up with the idea to showcase some of the great Chefs of New Orleans, past and present. We’re not talking about the superstars like Prudhomme and Lagasse, but the somewhat lesser known New Orleans Chefs and cooks that, although not nationwide superstars, are heroes to anyone who has had the pleasure of tasting their top notch cooking. In addition to a bio on each Chef, we will have a follow up post with a recreation of a dish he/she is most famous for, in this case Austin Leslie’s Fried Chicken Recipe. I’m sure mine won’t be as good as theirs, but I will do my best. Special thanks to Jason Perlow from Egullet for letting us use his wonderful photo. For the many who never got to experience the late Austin Leslie’s expertise, he was one of the great, real Creole Chefs in the country. 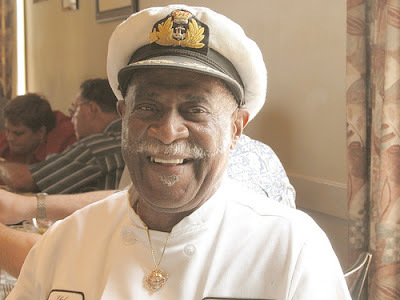 His long tenure at Chez Helene got him recognized by many as, “The Godfather of Fried Chicken” but he was more than adept at the other facets of Creole cooking like gumbo, stuffed peppers and many others. In 1952 Leslie left Portia’s and his home town for a crack at business school, but returned home the next year, working for a time at Portia’s and then in a sheet metal shop. When times were slow at the shop he also worked at his Aunt Helen DeJean Pollack’s restaurant, Howard’s Eatery on Perdido. In 1964 Austin’s Aunt Helen moved her Eatery to 1540 N. Robertson Street off St. Bernard, and added an e to her name, calling the restaurant Chez Helene, for a touch of class. Leslie came along, working at the beginning as Co-Chef with Aunt Helen’s brother Sidney DeJean. Leslie brought along what he learned at D.H. Holmes, and combined those dishes with some of his Aunt’s menu items, this was the beginning of the cuisine he became famous for: Creole-Soul. Leslie declared bankruptcy in 1989 and the last Chez Helene closed its doors for good in 1994. The building that once housed the original restaurant burned down shortly after. Here is a picture of the lot where Chez Helene used to stand. In the midst of the flooding in the wake of Hurricane Katrina, the 71 year old Austin Leslie, like many others, was trapped in his attic for 2 days in the stifling humidity and 98 degree heat. He was later rescued and relocated to the New Orleans Convention Center, until being taken to Atlanta. The last time Barre spoke with Leslie he was anxious to get back to work. Barre said, “Austin called me two days ago, and we had an extensive conversation. He wanted to get back to work. He wanted to get back into the kitchen.” On September 28 he was admitted to an Atlanta hospital for a high fever and died the next day. Thanks Jill, Bill and I are learning a lot while doing the research, as well as having a lot of fun. you should make a book of this series. I’d buy it! This anniversary of the flooding at New Orleans got me to thinking about Chez Helene’s and the wonderful food I’ve had there. Of course, Chef Austin came to mind. Until I made a search on the internet I was not aware of Austin’s passing. One more sad event and a major one, to be sure, for all who remember the good times at New Orleans. We were at Pampy’s 2 weeks before the hurricane. Austin came out of the back to hang out, tell stories and draw fabulous charicatures of himself on our paper tablecloth. We frequented Jacques Imo’s during the Austin days then of course followed him when he left for Pampys. Who wouldn’t, we’d never had fried chicken like that in our lives. He told us about his recent visit to a culinary school where he taught them his secrets. He believed that his gift needed to be shared and passed down through the young-ins. He then called out for his Apprentice whom he had meticulously trained at Pampy’s and whom he felt really understood his famous fried chicken recipe we all hung out a little longer finishing up with his also famous Bread Pudding. Austin then ask his Apprentice to go to his car and grab us a couple of copies of his cookbook which he promptly autographed (with self-characture), added his cell phone number and we talked about the possibility of having them cook for my film crew. I was in Los Angeles when I got the devistating news of his passing. To this day I always smile when I drive by Pampy’s or pick up my cookbook and will never forget that last night we got to hang out. By the way we kept that paper tablecloth too. I’ve tried to find his young Apprentice whom Austin passed his gift several times over the last year and a half to no avail–unfortunately we couldn’t remember his name and all of the people we knew who had that connection are no where to be found or have relocated. Do you happen to know his name or where he might be found cooking these days? This may mean nothing to you, but my aunt and uncle’s last name was Dejan, not Dejean. Just thought you might want to know. I visited the restaurant in 1991. I loved the show Franks Place, but I don’t recall if that was my main reason, or if it was in search of New Orleans ‘Soul’ food. Anyway, I was greated by Austin. I don’t know what else I had, but my memory includes wonderful smothered cabbage with pickled pig tails. Ummm. I think the waitress was a little surprised that I, neither southern, nor black ordered it (little did she know about my german relative love of pig tails and cabbage albiet fermented!). He was a gracious host, although not at all modest. I purhcased his little book, and he signed it with a little drawing of himself. Of all my memories of the City, my evening at Chez Helene’s remains at the top. Thanks Austin. You are remembered and appreciated. Rest Well. I’m the son of Muce B. Benjamin and I’m try to write a book on the forgotten… “Great Chefs of New Orleans.” There are many who think he belongs with this group. As the Master Chef at Delmonic’s for 27 years, there was no mention of his name in the history of Delmonico’s published bt Emeril Degrasse. If you don’t believe me… ask Madame Leah Chase. Looking for Steven and Ann Herrel (sic?) they were stationed with my sister Deborah whitfield and her husband Timothy (then) steven said he was Leslie Austin’s nephew, he gave my sister a copy of “Chez Helene”, a red paperback cookbook. I have used that cookbook to death, it has brought me endless enjoyment. does anyone know Steven and Ann? My name is Stephen Harrell; Austin Leslie was my mother’s brother and Godfather. He is missed by all of his family. Austin has left me with the tools and knowledge to carry on his craft. As a young boy, age 8 to be exact I began working at Chez Helene side by side with my uncle Austin, whom we fondly called him uncle “butter bean”. I fondly remember my aunt Helen Dejean Polock who originally opened Chez Helene Restaurant. As a small child Chez Helene was a family business where my mother and three older brothers worked in the kitchen. While working in the family business we were taught by Aunt Helen and Uncle Austin in the art of New Orleans Creole cuisine. I have not forgotten the memories or recipes of my family business and heritage; it is forever sealed in my memory. I had the pleasure of eating at Chez Helene’s before it closed. I will never forget that succulent fried chicken and gumbo!!! I used to go to Chez Helene as often as I could. After I married, I suggested to my wife that we pick up some chicken from a place I liked and go meet her sister in Baton Rouge for a picnic. As we approached the restaurant, she grew a little skittish over the neighborhood but we visited with Chef and he fried a whole chicken for us. We left from there for Baton Rouge. By the time we got to her sister’s place there was nothing left but a drumstick. And it had a couple of bites out of it. I still have one of his little books with the autograph and art and I treasure it.